The Hadwiger number of a graph \(G\) is the largest integer \(h\) such that \(G\) has the complete graph \(K_h\) as a minor. 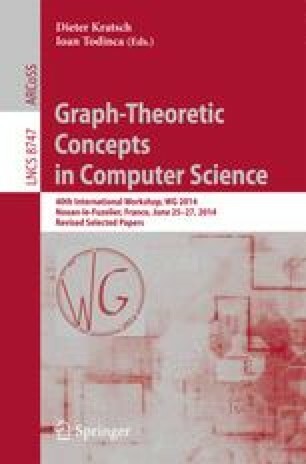 We show that the problem of determining the Hadwiger number of a graph is NP-hard on co-bipartite graphs, but can be solved in polynomial time on cographs and on bipartite permutation graphs. We also consider a natural generalization of this problem that asks for the largest integer \(h\) such that \(G\) has a minor with \(h\) vertices and diameter at most \(s\). We show that this problem can be solved in polynomial time on AT-free graphs when \(s\ge 2\), but is NP-hard on chordal graphs for every fixed \(s\ge 2\). The research leading to these results has received funding from the Research Council of Norway and the European Research Council under the European Union’s Seventh Framework Programme (FP/2007–2013)/ERC Grant Agreement n. 267959.